Rochester Gas & Electric No. 1950 was originally built for Quebec Iron & Titanium #3 at the Allard Lake Mine in Havre St. Pierre, Quebec (the world’s largest body of titanium ore). Rochester Gas & Electric appears to be her second owner, though we have no firm date as to when the locomotive was acquired. The engine initially worked at Russell Station, then moved to BeeBee Station. When major operations at BeeBee Station shut down in 1996, the locomotive was returned to Russell Station where she finished her career. 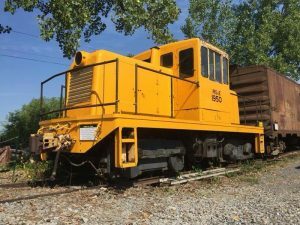 When RG&E began their planned shut down of Russell Station in 2007, the locomotive known as “Old Yellow” was donated to the Rochester & Genesee Valley Railroad Museum. Having been assigned no number while at RG&E, we have applied the number “1950” in honor of its build date (much like it’s sister unit, RG&E 1941). The locomotive was delivered to the museum in operating condition in 2008. Volunteers are currently evaluating the locomotive for reconditioning and a return to full-time service on our museum railroad.